I just bought Norton antivirus 2012 yesterday and installed it. I ran a full system scan and it removed/quarantined 6-8 files that were adware/ malware/ Trojan files. But the reason I got Norton's antivirus 2012 for is still happening, certain programs are unable to open or operate. These programs include: iTunes, windows defender, sony vegas 10, windows photo gallery and others. And all programs crash when I try to open or run any of them, it says: (Whatever program I to use) has stopped working - A problem caused the program to stop working correctly. This problem just started happening yesterday haven't had any problems before. I thought Norton would fix this but have done another full system scan and Norton doesn't seem to find any virus. So now I'm here and I don't know what to do. Sorry you are having a problem. Have you run NAV while in the safe mode? Have you downloaded and run the Norton Power Eraser? It's Norton compatible and makes a good second opinion scanner. Yes I downloaded and ran Norton Power Eraser, it didn't detect anything wrong. And no I havent run NAV in safe mode yet, I was going to do that but I came here for help instead. I downloaded and ran Malwarebytes scanner and it detected 6 files but only the last one was check marked to remove. Should I attach log from this scan? 2012-07-14 13:58:46,Low,ie4uinit.exe detected by SONAR,Attention Required,Remove this Security Risk now. 2012-05-12 13:50:47,Low,setupdatamngr_searchqu.exe detected by SONAR,Attention Required,Remove this Security Risk now. 2012-05-12 13:48:15,Low,iexplore.exe detected by SONAR,Attention Required,Remove this Security Risk now. 2012-05-12 13:48:10,Low,iexplore.exe detected by SONAR,Attention Required,Remove this Security Risk now. 2012-05-06 8:03:07,Low,iexplore.exe detected by SONAR,Attention Required,Remove this Security Risk now. 2012-04-26 3:37:40,Low,ielogic.exe detected by SONAR,Attention Required,Remove this Security Risk now. 2012-04-07 16:48:27,Low,ie4uinit.exe detected by SONAR,Attention Required,Remove this Security Risk now. 2012-04-07 16:41:20,Low,ie4uinit.exe detected by SONAR,Attention Required,Remove this Security Risk now. 2011-08-11 7:28:58,Low,ie4uinit.exe detected by SONAR,Attention Required,Remove this Security Risk now. 2011-07-31 14:19:47,Low,iexplore.exe detected by SONAR,Attention Required,Remove this Security Risk now. 2011-06-07 12:30:44,Low,iexplore.exe detected by SONAR,Attention Required,Remove this Security Risk now. 2011-05-11 23:39:14,Low,iexplore.exe detected by SONAR,Attention Required,Remove this Security Risk now. 2010-09-12 11:50:36,Low,ie4uinit.exe detected by SONAR,Attention Required,Remove this Security Risk now. 2010-09-12 11:18:43,Low,ie4uinit.exe detected by SONAR,Attention Required,Remove this Security Risk now. Okay I was checking all user accounts and on the original administrator account (I made new admin to install NAV) always has this pop up when log in to the old admin account and I don't do anything or open anything before this pops up (I clicked retry but nothing happens and pop up stays the same, I click cancel and its gone). Also this doesn't happen in other user accounts, just this certain account for some reason. Also can't access firefox browser on that account, (works fine on other accounts) so then I open internet explore and for some reason searchqu.com/406 is the default home page, I looked it up and this is suppose to be a virus site? I already changed it to google.com as homepage. Just want to know if its alright to delete this admin account or should I leave it as it is? I'm not sure that deleting the user account will solve any problems. What did the safe mode scan do for you? You might want to try running chkdsk /r on your hard drive. 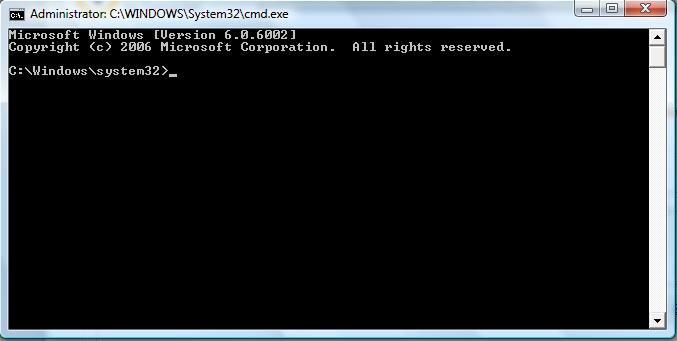 Click on Start button, type 'cmd' and right click on cmd.exe and click on run as administrator. You will have to allow chkdsk to run after the next reboot. Safe mode scan just detected & removed 35 tracking cookies. Nothing else was detected. From that point type "chkdsk /r" . You will have to accept the prompt to scan at the next reboot. This will check your file system and the physical disc surfaces for errors. The scan will take some time to complete, depending on the size of your drive. Okay I did that but doesn't scan. 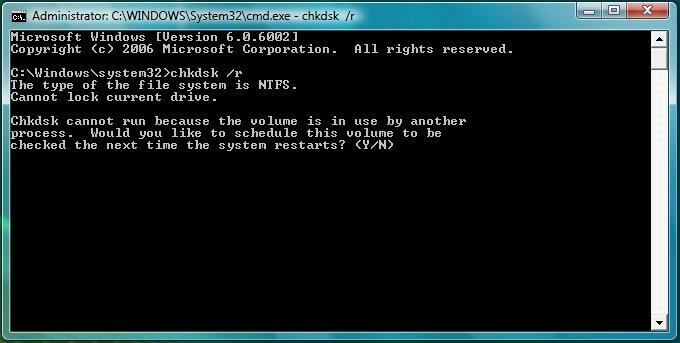 here's a screenshot of what happens after typing and entering "chkdsk /r"
Thanks for the help peter. As I noted, you have to accept the option to check on the next system restart (reboot). Then reboot the computer and the scan will take place before Windows loads. I did reboot after, but no scan. It was restarting like normal then the screen turned black and words in white poped up but was doing something at time so didn't get a good look if it was scanning or not. And it only lasted a few seconds and then it started normally. Will try again see if anything changes. Okay it just finished with the scan, what now? Thinking of rebooting my computer to factory settings but will wait till I have an external hard drive to put all the files that dont fit in 4GB flash drive. Would this be good? That is a last resort option, lots of work to reinstall all the programs that did not come with the original installation. As you have done multiple scans that did not find anything nasty, I would think it safe to say that that one user account has become corrupted. If it is just that one user account that has this issue, I would stop using that account for a while to see if things work properly. If it seems that it is just that account, be sure to have an administrator account still on your system, then from that new admin account you can delete the problem account from your computer. Please let us know how things work. Yeah I know that's a last resot option, I've had to do that few times before. What if it's a guest account? The guest account been off for a couple months but I just remembered there was some problems with it so had to turn it off. For some reason guest account says its an administrator account when turned on. Is there a way to fix this back to how it should be? Wow! 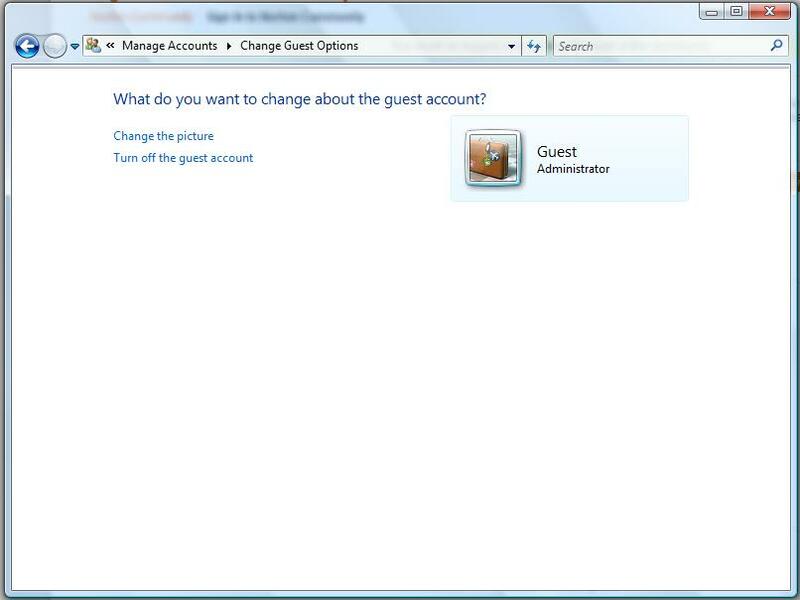 A guest account with administrator privileges . That is definitely a no no. 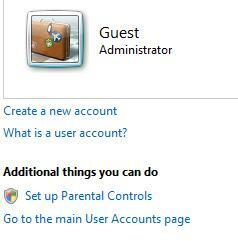 I would change the account type for that guest account to a standard user, and continue to keep it disabled. I have never had the need for a guest account. Sorry dont know why screenshots woudnt show in my last post. Is there any other places (websites) you would recommend to check out, to help fix my problem? Since I'm guessing this might not be a virus problem after all? Screenshots need to be accepted/OK'd by a forum admin. It can take a little time to be OK'd. I googled 'guest accout administrator' and got different suggestions up to re installing Windows. I will let you do your own search with that idea of what to look for. Please let us know if you find a solution. Well did some research and found out that guest account is disabled by default for a reason (Many other users had same issue), and only solution I found was to reboot my pc to factory settings. Also an update on the reason I was here on the first place, deleted all user accounts except an admin account and the problem i been having wasnt fixed. So looks like my only option right now to fix these issues is to reboot my pc. If you have not yet restored your computer, try asking your question at microsoft.com. The forums there will have Windows experts that might be able to help without the factory restore. Step 1: Boot into safe mode and check if the issue persists. Step 2: If the issue does not occur in safe mode, you may put your system in clean boot state (in normal mode) to troubleshoot the issue. Note: After troubleshooting, make sure to set the computer to start as usual as mentioned inStep 7 provided in the above KB article. Method 2: Try performing SFC (System File Checker) scan on the computer. Method 3: I would also suggest you to scan your computer with Microsoft Safety Scanner, which would help us to get rid of viruses, spyware, and other malicious software. The Microsoft Safety Scanner is a free downloadable security tool that provides on-demand scanning and helps remove viruses, spyware, and other malicious software. It works with your existing antivirus software. Note: The Microsoft Safety Scanner expires 10 days after being downloaded. To rerun a scan with the latest anti-malware definitions, download and run the Microsoft Safety Scanner again. Important: While scanning the hard drive if any bad sectors are found, the scanner tries to repair that sector, any data available on that might be lost. Also refer the following links. did method 2 and looks like there's some files that cannot be repaired and mainly its "settings.ini" of Microsoft-Windows-Sidebar and "app936.fon" of Microsoft-Windows-Font-Bitmap-Terminal. And windows sidebar just crashed today. Couldn't do method 1 since I know it has same issues in safe mode. Well, I wish you luck with finding a solution. It does seem you are at a point that you need to restore to factory conditions. Always a last resort, but sometimes necessary.